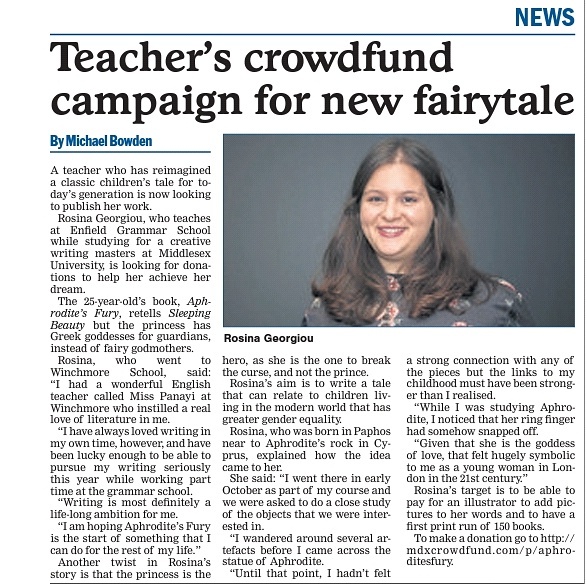 Featured in the Enfield Independent today! So exciting! Chance to Win! You will be entered into a raffle to win a signed copy of Aphrodite's Fury with a personalised message - only 30 available. You will receive a podcast containing a secret interview with Xara - the princess in Aphrodite's Fury. Early bird! You will receive - a numbered paperback copy of Aphrodite's Fury from the first print run; - a copy of the Aphrodite's Fury secret interview podcast. You will receive - a numbered and signed copy of Aphrodite's Fury from the first print run; - a copy of the Aphrodite's Fury secret interview podcast. Signed artwork! You will receive: - a numbered and signed print of the art work from the book; - a numbered paperback copy of Aphrodite's Fury; - a copy of the Aphrodite's Fury secret interview podcast. Special Mention! You will receive: - an acknowledgment in the credits of the book; - a signed and numbered copy of one of the first 10 printed copies Aphrodite's Fury in the first print run; - a copy of the Aphrodite's Fury secret interview podcast. A Reading with the Author You will receive: - a reading with the author and Q&A session; - a creative writing workshop; - a signed copy of Aphrodite's Fury with a personalised message; - a copy of the Aphrodite's Fury secret interview podcast. You will be able to choose the name of a character in an upcoming book. You will receive: - a signed copy of Aphrodite's Fury with a personalised message; - a copy of the Aphrodite's Fury secret interview podcast.